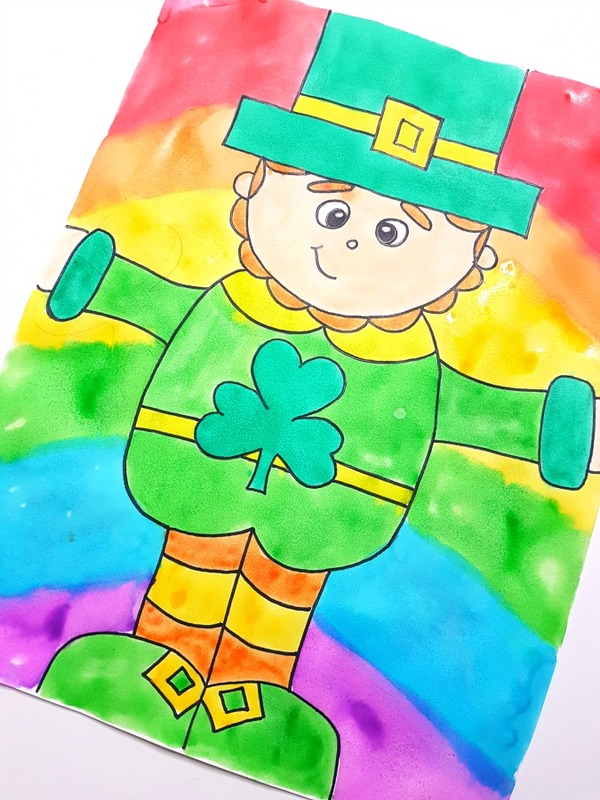 This directed drawing for St. Patrick’s Day will teach your students how to draw a leprechaun. 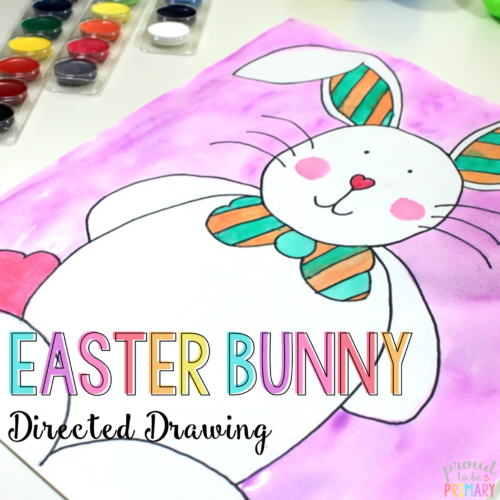 It is sure to excite and entertain kids during your March festivities. 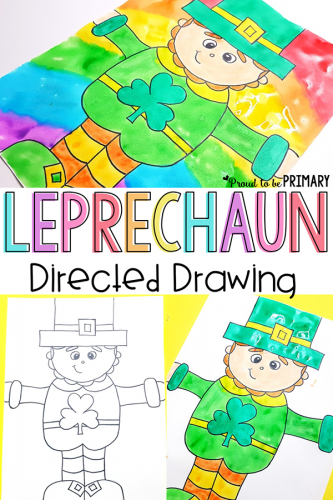 This directed drawing activity teaches children how to draw a leprechaun. 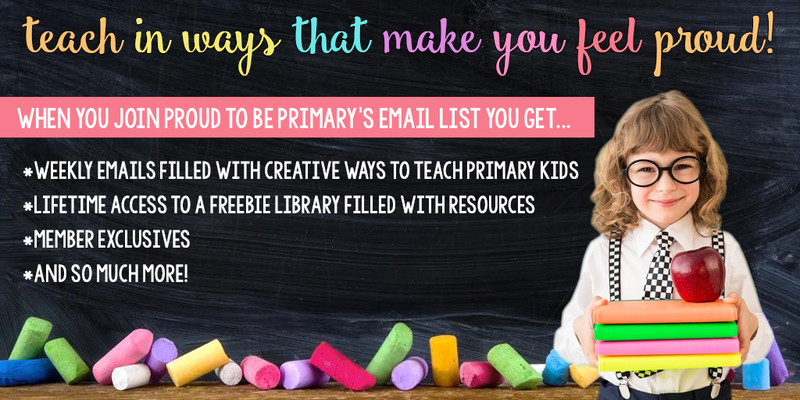 It can be adapted for any primary classroom or completed at home with a few simple materials. 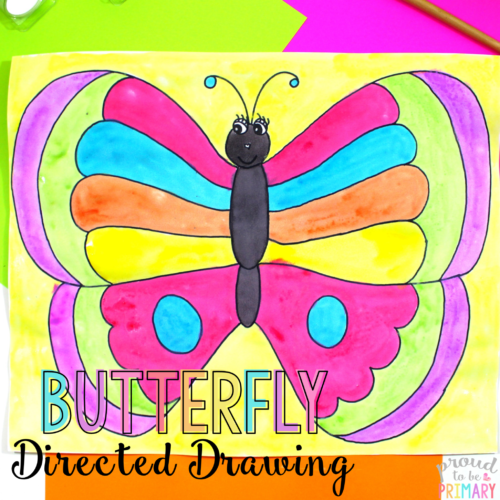 The fun, colorful results can be used to decorate your classroom walls and would be a great companion to your writing activities. I recommend proper paper meant for painting because it can handle the water and shouldn’t tear the paper if used properly. kids can sit at tables with their supplies. You will have the most success if you model the lesson this way and take your time. 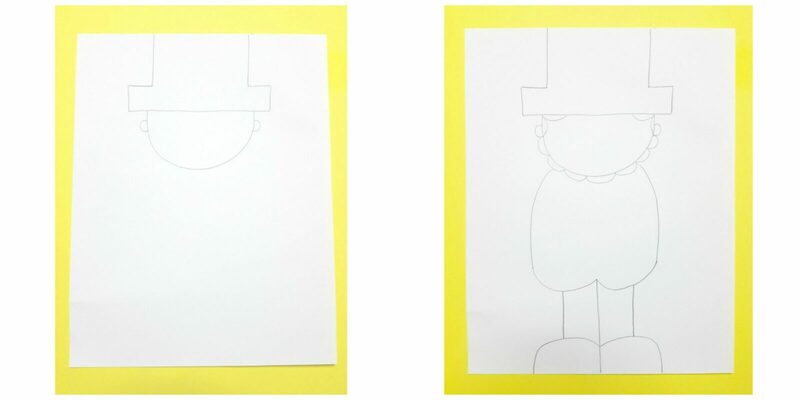 Below are the steps for the leprechaun directed drawing art lesson. There are FREE printable directions available at the end of the post. 1.Place a large white piece of paper in landscape orientation. For the hat, start with two short lines down from the top of the page leaving even amounts on both sides. Draw a rectangular shape connected to the end of the other 2 lines. 2. 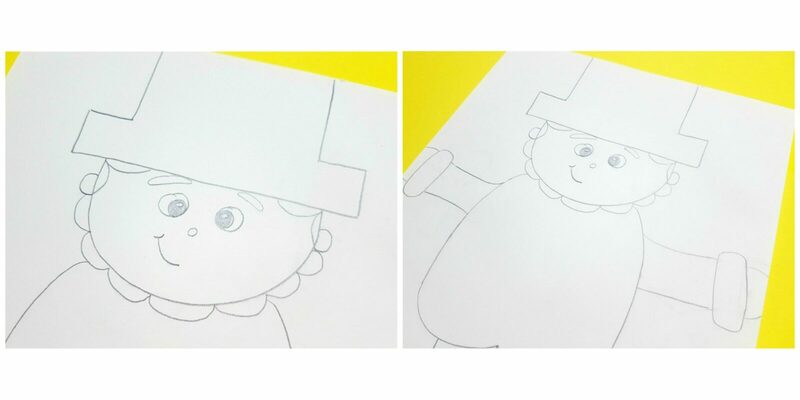 For the head, draw a circular shape under the hat. Emphasize not to draw the hat and head too big and keep it in the upper part of the page. Add 2 small ears outside of the head. 3. For the beard, draw curved lines along the bottom of the head under the ears. Add 2 curved lines inside the head at the top to make hair. 4. For the body, draw 2 curved lines down from under the chin. Make sure to leave room for the legs underneath. Connect the 2 lines in the center like you are drawing an upside down heart. 5. For the legs and shoes, draw a straight line down from the center part where the body connects. Draw 2 more straight lines down, but not all the way, to make the legs. Draw 2 curved lines out from the center line and connect with the bottom of the page for shoes. 6. For the face, draw 2 small round eyes. Draw 2 more circles inside the eyes connected to the inner corners. Color them in leaving a small white space uncolored. 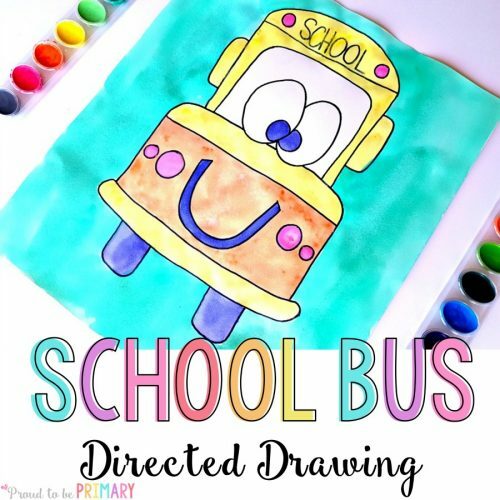 Draw a tiny circle for the nose. Create a smirk smile by drawing a curved line to the side. Draw 2 thin ovals above the eyes under the hat for eyebrows. 7. For the arms, draw 2 sets of arms going out from each side of the body. Add a cuff to the end of the lines and 2 more sets of curved lines for hands. You can get creative here and have the leprechaun hold a gold coin or shamrock if you wish. 8. For the shamrock in the center of the body, tell kids to start with a heart shape leaving an open shape at the bottom. Get them to turn the page both ways and draw another heart shape, making 3 heart shapes connected. Add a stem. 9. Add extra details. For the hat, draw a square in the center and another smaller square inside that. Draw 2 sets of lines going out from the inner squares. 10. 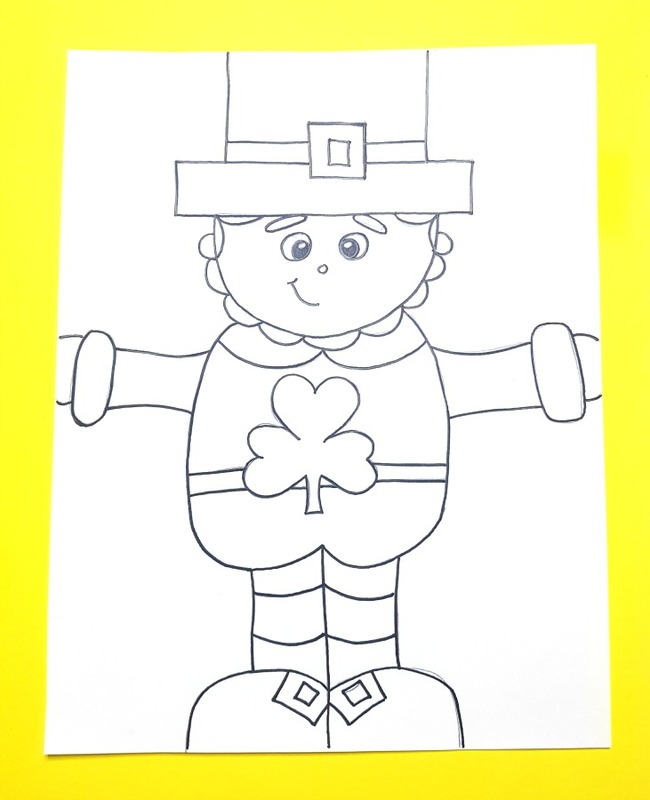 Give the leprechaun a belt by drawing 2 lines across the center of the body. Remember to go under the shamrock, not over it! 11. For the legs, draw 2 lines going across on each to give his pants a pattern. 12. For the shoes, add a square and another inner square on each to make a buckle. Complete the activity over two days or periods of time. On day one we complete the drawing and the tracing with a black marker. 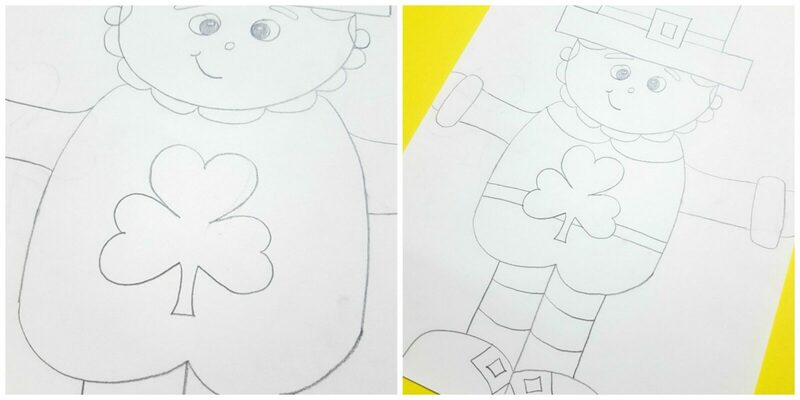 Use a fine point black marker or Sharpie pen to trace all the lines of the leprechaun. Erase the pencil lines with a good white eraser. One day two we paint. If your class hasn’t used watercolor paints before, you should demonstrate how to make proper brush strokes with a paintbrush and the water to paint ratio. I usually use larger paintbrushes instead of the small ones that are normally included with watercolor paint sets. Use watercolor paints to paint the smaller details of the leprechaun first. Use different shapes of green paint, as well as orange and yellow. Next paint the larger areas of the leprechaun. It is up to you if you wish to leave him on white paper or paint the background. Painting a rainbow is fun and colorful! 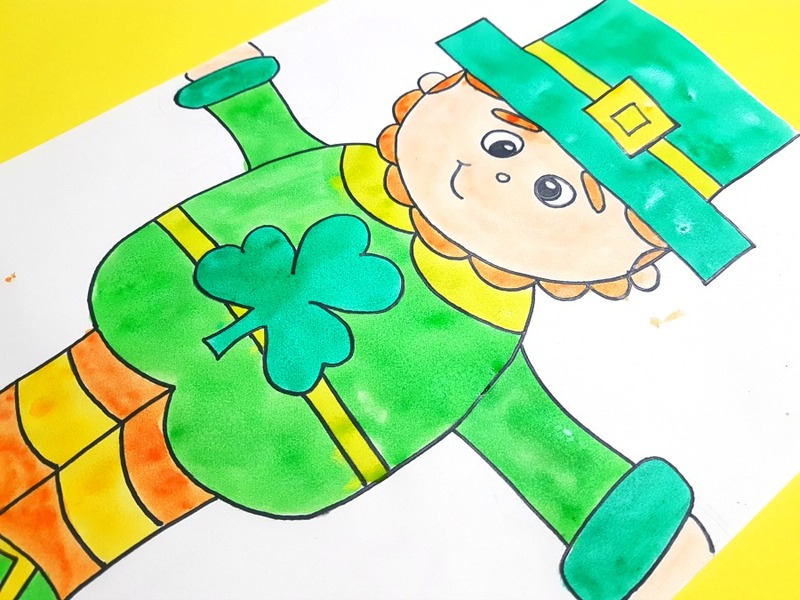 You could also cut out the leprechaun and glue onto construction or other special paper. Once everyone completes their leprechaun, place them somewhere to dry completely. Don’t make the mistake to hang them or place them upright. Paint and water would drip down onto the pictures. Once dry, hang them up or create a fun bulletin board display for March. 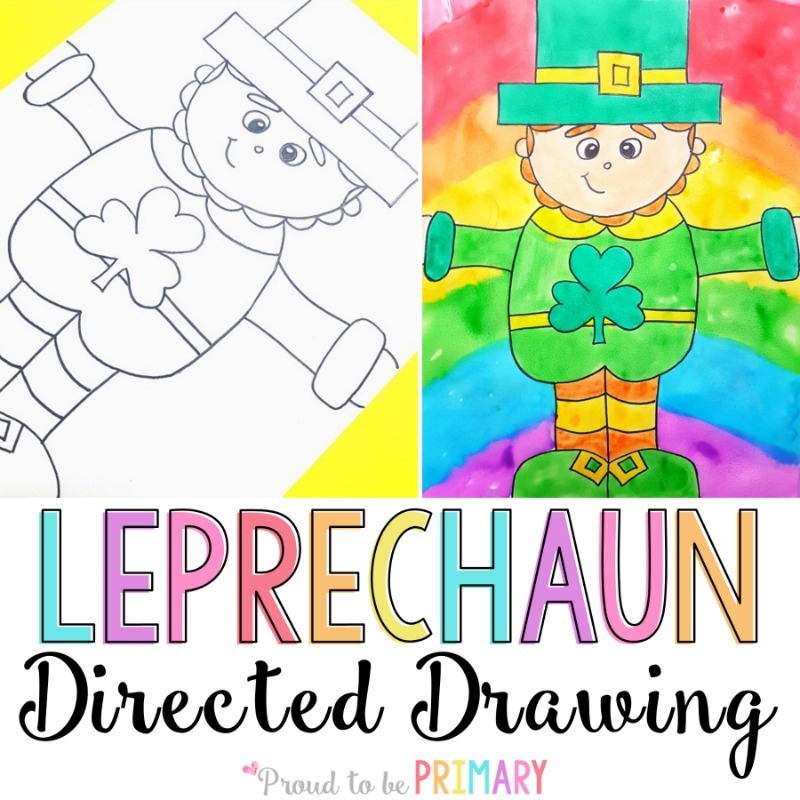 You can download and print the instructions for the leprechaun directed drawing for St. Patrick’s Day by clicking the image below. Click the links to view these popular posts! What kind of water colors do you use? I use crayola watercolors. I think it’s the 24 color set.